"The Fishing Industry's Cruelest Catch,"
Corporate Responsibility in the Seafood Industry: What About People? Disclaimer: All resources listed have not been conclusively verified. While every effort is made to insure accuracy of information, the Schuster Institute for Investigative Journalism and Brandeis University can not be held responsible for errors or omissions. The views expressed on external websites should not be taken to represent the Schuster Institute or Brandeis University's views and policies. Listing an agency does not indicate endorsement. The Protection Project at Johns Hopkins University, Washington, D.C.
Matthew Friedman, UNIAP, spoke at the Hartford Public Library's Forum on Human Trafficking, July 19, 2011. 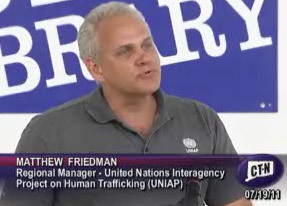 Friedman is also a co-founder of The Mekong Club. Terre des Hommes Swiss Foundation has created a digital library with more than 3,200 documents related to child trafficking. Human Trafficking Research Database, by subject, developed by teams at the University of North Carolina at Chapel Hill's Carolina Women's Center. Terre des Hommes Swiss Foundation's digital database and library, more than 3,200 documents related to child trafficking, searchable. U.S. Cases of Human Trafficking Database, Human Trafficking Clinic, University of Michigan Human Trafficking. European Commission, an extensive compilation of research reports, manuals, guidelines, and other publications related to human trafficking, and produced by various institutions and agencies.